2. Seamus was running around the shelter for 4 days before the cops and animal control could catch him (I experienced this escape trick 4 times since I’ve had him – never lasts more than 20 minutes – he gets tired and lets me catch him). He also really hates strangers but if he knows you for ten minutes he loves you or tolerates you! 3. On the night of my shift – a co-volunteer pulled me into a room to tell me he was to be placed in a Foster to adopt situation. I think she knew I was going to lose my cool! She was right. 4. I bawled my eyes out. Like all night. I took him to “our” patch of grass where I hugged him and cried. I had been thinking of ways I could keep him (my apt didn’t allow dogs). 5. Over some alcohol and Mexican food with the other volunteers, I vowed if the Foster to adopt didn’t work out I would find a way to take him. 6. He was returned after one and a half days!!! I have had him now for 7 years!! I was never that attached to another dog at the shelter, sometimes you just know. 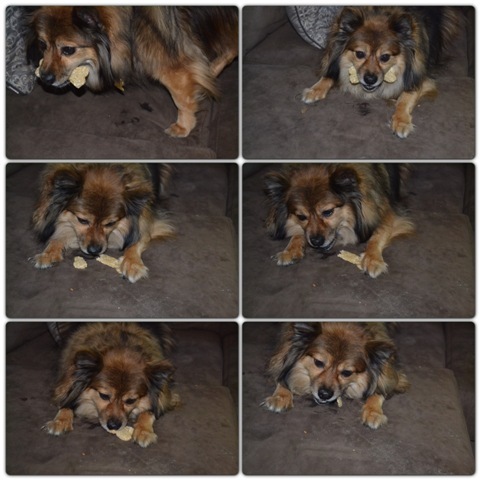 With a recent scare of him getting a UTI, to what I found out later was due to Chicken Jerky made in China that has been recalled, I threw out his treats and decided to make my own. I don’t know why I didn’t think of this sooner. The recipes I found on Pinterest were all pretty easy and ingredients I already had in the house. The peace of mind for making them myself outweighs the 20 minutes it took to make the treats. For the original Pin click here. *NOTE: Some dogs can have wheat allergies so use gluten free and always watch your dog when switching up their food to make sure there is not a negative reaction. Scratching or scabs are just some symptoms. 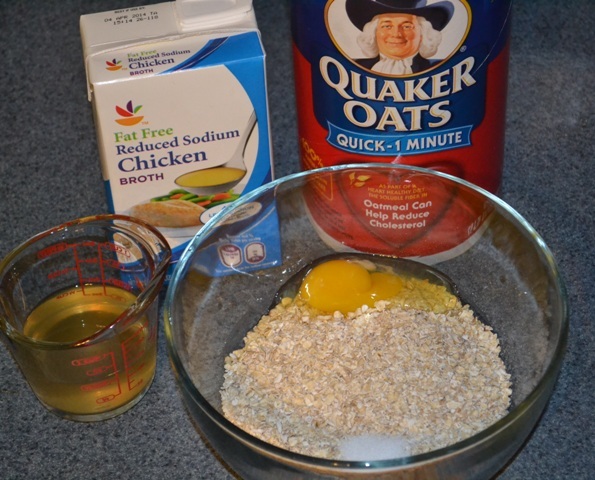 Add 2 cups oats, salt, chicken broth, and egg to a large mixing bowl. Combine well. 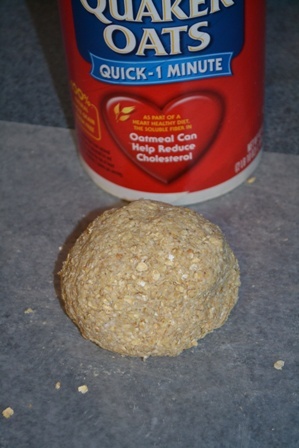 Add remaining ½ cup of rolled oat and combine. Press to ½-inch thickness. Cut with cutter (I already had a dog bone shape from a Xmas gift) and place onto a parchment paper lined baking sheet. Bake for 20 minutes. Remove from oven and allow to cool completely. Store in an airtight container for use or store in a Ziploc bag in the freezer for later thawing and use. This recipe made about 10-12 large-sized bones. A must try for your canine babies! I love that you can make a large batch and freeze for later. See them disappear in 3..2..1.. I also tried this pin for Sweet Potato jerky and he liked it. The bad part is it took 3 hours or more to make it and the next day the jerky was semi-soft again. I most likely will not make again. Again he liked it, just to time consuming and didn’t last long. Maybe if I had a dehydrator it would be less work. Hoping to try a few more soon! Now head on over to our two co-hosts Steph and Katie. 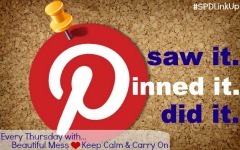 Be sure to check out all the other pin inspired projects completed by clicking below. Yum! I bet our Cruz would love these too. And that is such a cute story!! OMG he is adorable! Of course you fell in love with him! 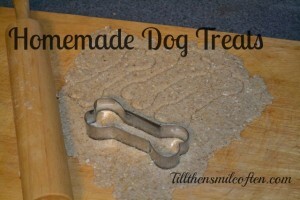 I had no clue you could make your own dogs treats. Obviously I’m not currently a dog owner but will definitely be getting one in the near future. This is very good to know! Thank you! He totally makes me smile everyday! I have had him 7 years now! It is so much healthier for them to make them at home, if possible. I’ve made dog biscuits before–but with way more ingredients. This looks so simple! I’m going to try it later today with my kids! (not FOR my kids, but WITH!). My dogs like ones made with tomato juice, so I might substitute some of the chicken broth with that. 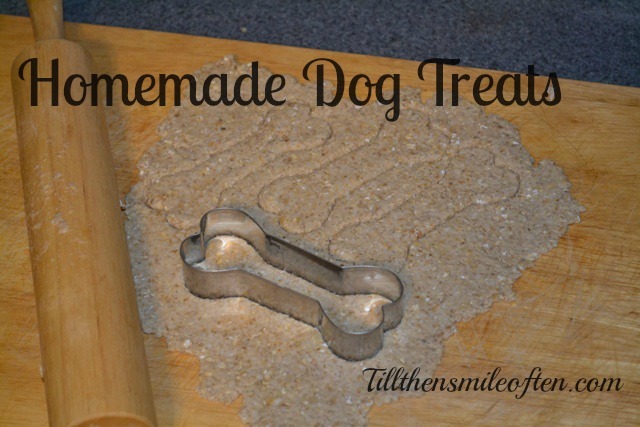 My pup loves this recipe and it is so quick to make! Love that you are involving the kiddos! You could probably replace all the broth for the juice. It just sort of “glues” it all together. I have used chicken and beef broth so I am sure juice would work! Let me know how it goes! I rescued my dog Norman (Bates) and it was the best thing I ever did! Shelter dogs really are the best! They make you smile everyday even when it is a really bad day! Your story made me smile. Your pup is adorable!!! We had a shelter dog we fell in love with too…we volunteered at a shelter for almost a year and had our hearts set on two dogs that we were going to take as soon as our house was ready (we were building). And then one of them got taken! We were devastated. Even though we were a month away on the house, we asked to put a hold on the other dog and the shelter did it for us. That sweet pup died a few years back but we probably had him close to 15 years! That is so awesome that the shelter held them for you! Sometimes it is just meant to be! Fifteen years is a good long time for a dog, glad you had him that long. I am sure he brought lots of licks, smiles, and drool but most importantly a lot of joy! Seamus is sooo cute. I recently lost my two elderly dogs. One was 18 years, 2 months, and 2 weeks. Her best bud only lasted two months after and she was 16 years and 8 months. Imagine miniature golden labs and that’s what I had. I miss them and some day hope to find the one or two that meant to be mine. 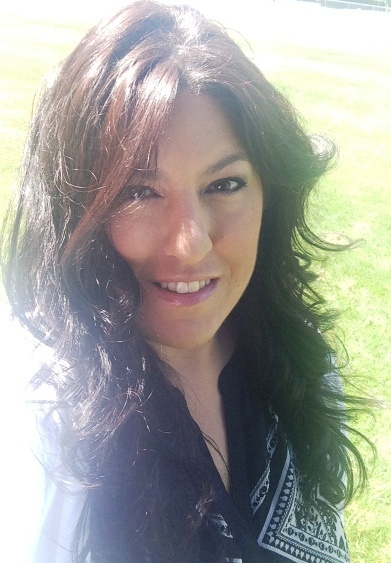 Loved your blog. Enjoy your SITS Day. Thanks! He makes my day brighter with his goofy grin! So sorry your dogs have passed but it looks like they lived a long and healthy dog life! Mini golden labs sound adorable, I had a black lab before Seamus! Hope you find another perfect for you pup! Seem easy enough to make! My oldest dog is a shelter dog. He, too, was a stray. We fell in love with him when he threw his rawhide at us as we walked by his cage. We’ve had him for 12 years! They are really easy to make! It is so amazing how sometimes they just choose us! So glad he has had such a loving home for 12 years, here’s to many more! Your Seamus is adorable! 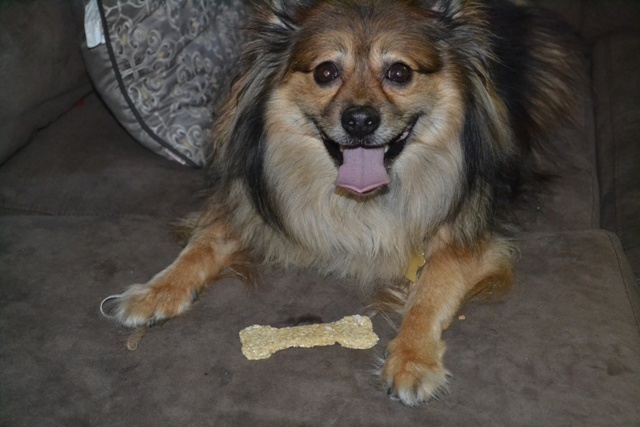 I was so excited when I saw your post because I just posted on my blog the story of my rescue dog. I used to volunteer at a shelter and I’m a big advocate for rescue groups. I have never made treats for my dog, but I’m so excited to try this. Seamus loves these treats and after the scare I had with recalled food it puts my mind at ease! I much prefer adopting from a shelter and would take them all home if I could! Heading over to read your story! SO glad you chose to adopt. And thank you, thank you, thank you for volunteering at a shelter. We need more people like you in the world! Thank you!! Volunteering is so rewarding!! It brought me Seamus and I got to ensure that those animals got some loving at least while I was there!! They called me the dog whisperer for the seriously damaged pups! They all would come and lay on me. I hope more people choose to volunteer! From the first time I walked him I felt like he was meant to be mine! So glad it worked out. My Dad let me keep him at his place until I bought a house. I went over 3 times a day to take him for walks and to play with him. Then I bought a house and he has free rein of every room! What a great story. You are right sometimes you just know. And thanks for the dog treat recipe. 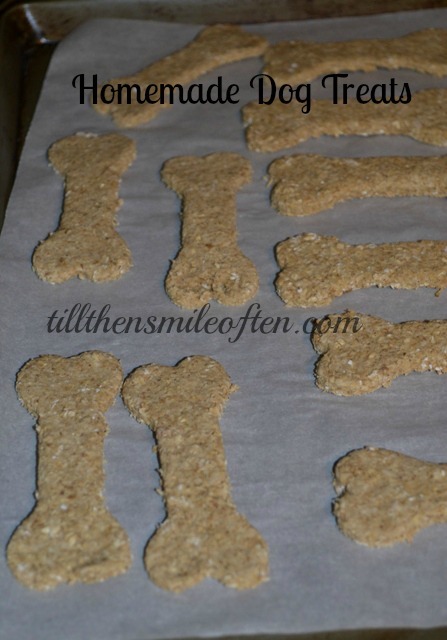 I like to make homemade treats for my dogs too – except my husband feels deprived. He thinks I cook more for them than I do him. You are very welcome! Poor hubby!! Though the dog can’t make his own and the hubster can! 😉 All dogs deserve to be pampered every now and them.